Good Food, Great TraditionGood food and small cafes have long been a tradition in Nicodemus, although most businesses are now gone. Ernestine’s Bar-B-Q is the last restaurant in town. The legendary Ernestine VanDuvall’s establishment is now operated by her niece and her revered recipe for barbeque sauce is sold through several outlets. During the annual Homecoming Celebration at the end of July, vendors from the community serve a variety of foods, including fried chicken, fish, and lots of barbeque for festival attendees. 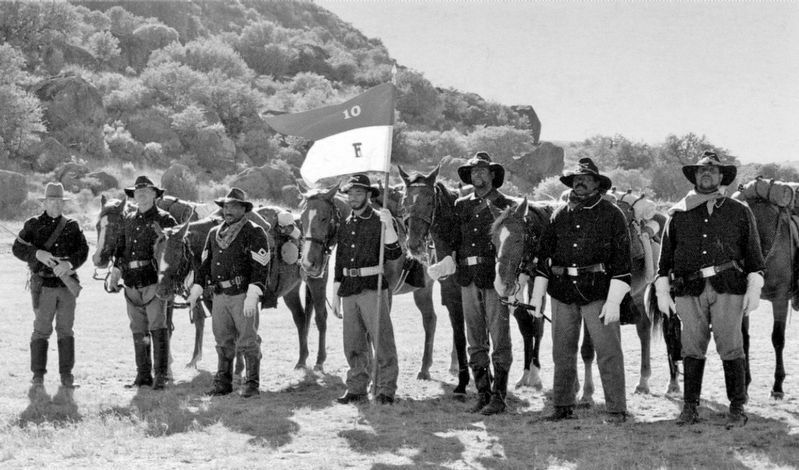 The Nicodemus Buffalo Soldiers Association, 10th Cavalry, Company F, makes appearances across the United States. The association honors the many contributions and sacrifices African Americans have given to the United States Armed Forces over the years. by the Nicodemus Livery Company. The Nicodemus Flour Co-op, established by five descendants, sells flour in town and via the Internet, providing an alternative market for their crop. An Oasis in the South Solomon River ValleyNicodemus Township lies in the eastern edge of Graham County along its boundary with Rooks County. Lying on an upland table north of the South Fork Solomon River, Nicodemus has always been an oasis in the surrounding open countryside typical of the High Plains region of Western Kansas. Ornate Signs and PlaquesThe community’s beautifully carved limestone welcome sign stands at the west end of town. It replaced a wooden sign that stood for years as a landmark along the highway. The native limestone sign was made and installed by a local artisan in 2001. The Masonic plaque at the intersection of Washington and Third Streets was installed at the location of the former Masonic Hall. Dedicated by the Kansas Prince Hall Masons, it commemorates the first Prince Hall Masonic organization to be established in the state. 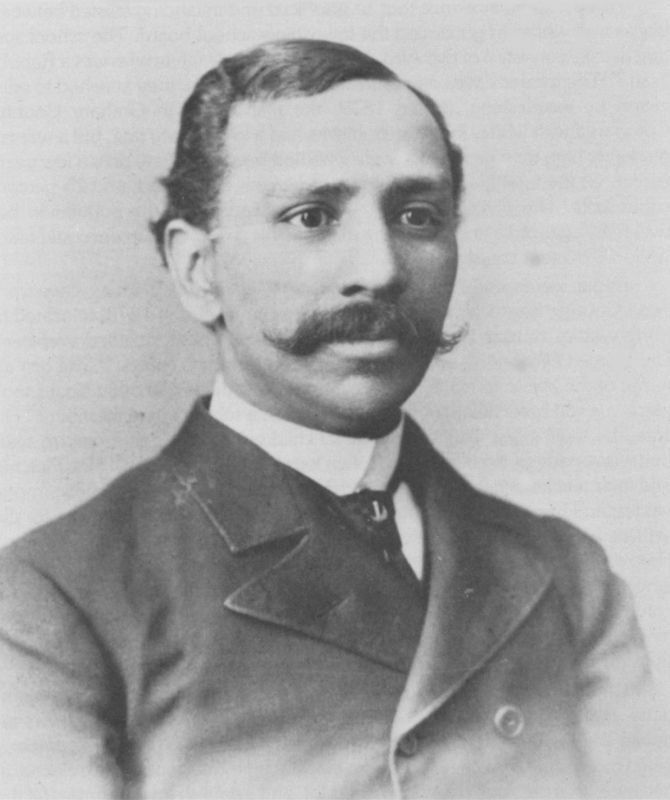 Early Nicodemus resident Edward P. McCabe became the first African American to hold a state political office when he was elected Kansas State Auditor in 1882.
held every year on the last weekend in July. It commemorates the freedom acquired through emancipation and the new lives and homes the original settlers made in the “Promised Land” in Kansas. The festival was first held at Scrugg’s Grove down near the South Fork Solomon River on R. B. Scrugg’s homestead, but was moved into town after the Township Hall was built in the 1930s. The public is welcome to attend the Celebration. 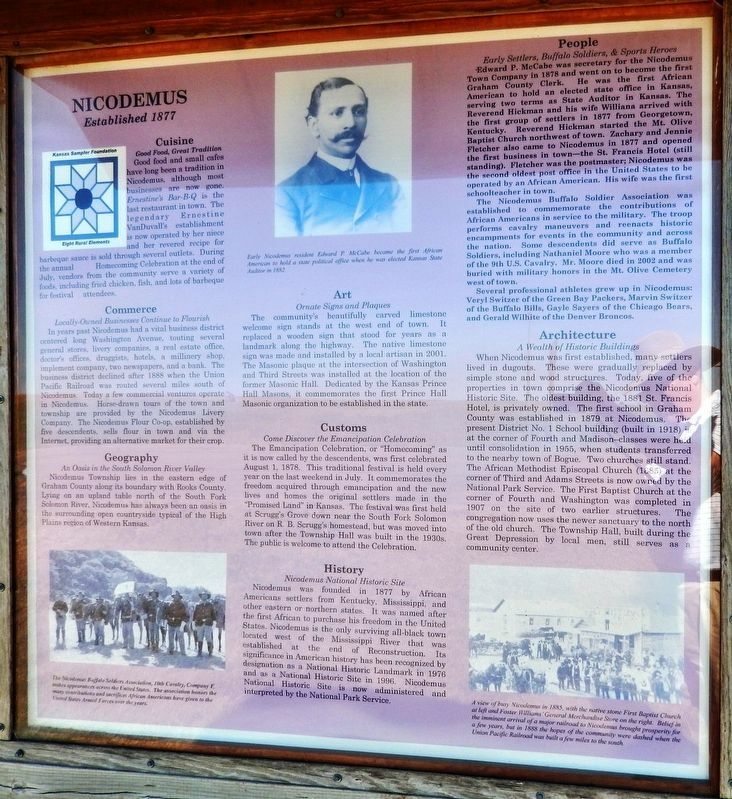 Nicodemus National Historic SiteNicodemus was founded in 1877 by African American settlers from Kentucky, Mississippi, and other eastern or northern states. It was named after the first African to purchase his freedom in the United States. Nicodemus is the only surviving all-black town located west of the Mississippi River that was established at the end of Reconstruction. Its significance in American history has been recognized by designation as a National Historic Landmark in 1976 and as a National Historic Site in 1996. 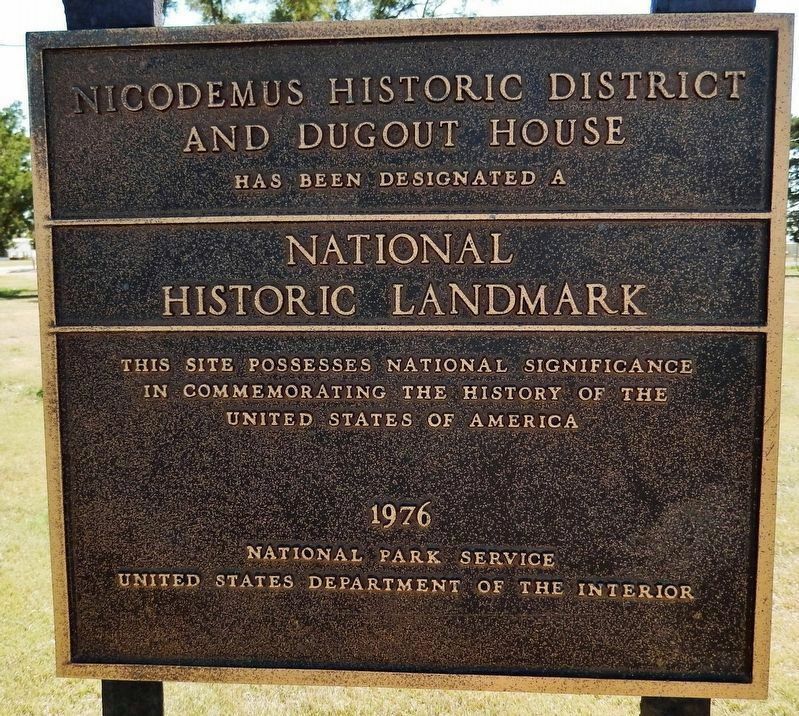 Nicodemus National Historic Site is now administered and interpreted by the National Park Service. Native stone First Baptist Church at left and Foster Williams’ General Merchandise Store on the right. Belief in the imminent arrival of a major railroad to Nicodemus brought prosperity for a few years, but in 1888 the hopes of the community were dashed when the Union Pacific Railroad was built a few miles to the south. office in Kansas, serving two terms as State Auditor in Kansas. The Reverend Hickman and his wife Williana arrived with the first group of settlers in 1877 from Georgetown, Kentucky. Reverend Hickman started the Mt. Olive Baptist Church northwest of town. 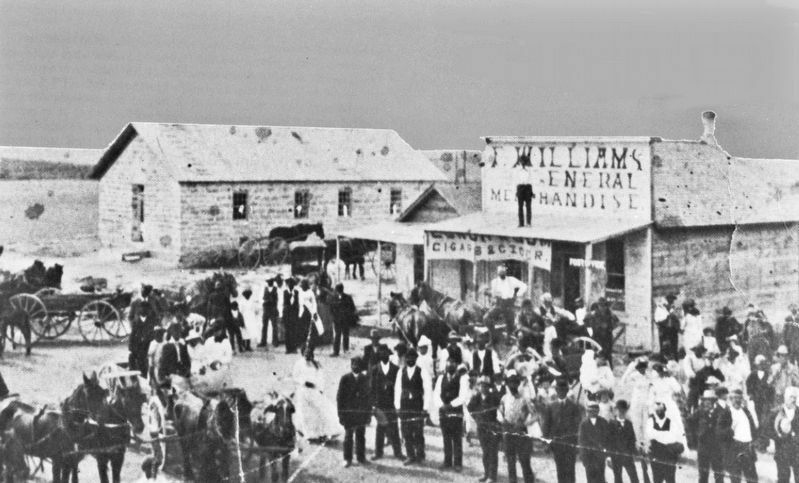 Zachary and Jennie Fletcher also came to Nicodemus in 1877 and opened the first business in town — the St. Francis Hotel (still standing). Fletcher was the postmaster; Nicodemus was the second oldest post office in the United States to be operated by an African American. His wife was the first schoolteacher in town. The Nicodemus Buffalo Soldier Association was established to commemorate the contributions of African Americans in service to the military. Some descendants did serve as Buffalo Soldiers, including Nathaniel Moore who was a member of the 9th U.S. Cavalry. Mr. Moore died in 2002 and was buried with military honors in the Mt. Olive Cemetery west of town. Several professional athletes grew up in Nicodemus: Veryl Switzer of the Green Bay Packers, Marvin Switzer of the Buffalo Bills, Gayle Sayers of the Chicago Bears, and Gerald Wilhite of the Denver Broncos. 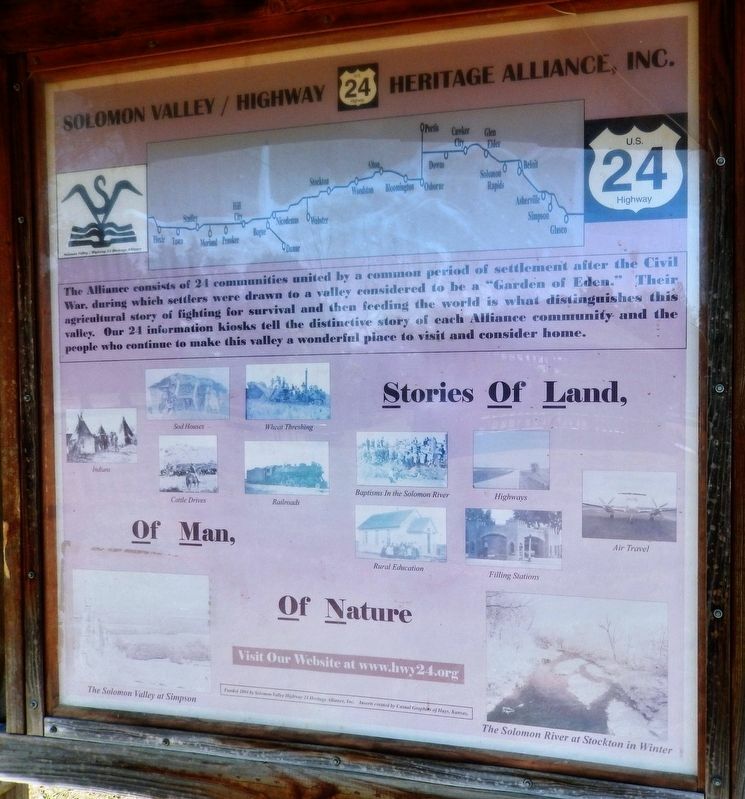 Solomon Valley Highway 24 Heritage Alliance, Inc. The Alliance consists of 24 communities united by a common period of settlement after the Civil War, during which settlers were drawn to a valley considered to be a "Garden of Eden." Their agricultural story of fighting for survival and then feeding the world is what distinguishes this valley. Our 24 information kiosks tell the distinctive story of each Alliance community and the people who continue to make this valley a wonderful place to visit and consider home. 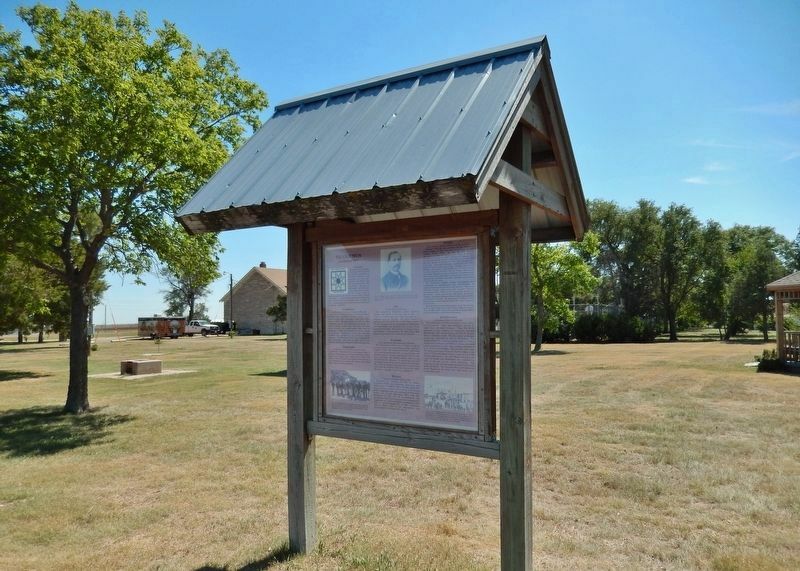 properties in town comprise the Nicodemus National Historic Site. The oldest building, the 1881 St. Francis Hotel, is privately owned. The first school in Graham County was established in 1879 at Nicodemus. The present District No. 1 School building (built in 1918) is at the corner of Fourth and Madison – classes were held until consolidation in 1955, when students transferred to the nearby town of Bogue. The African Methodist Episcopal Church (1885) at the corner of Third and Adams Streets is now owned by the National Park Service. The First Baptist Church at the corner of Fourth and Washington was completed in 1907 on the site of two earlier structures. The congregation now uses the newer sanctuary to the north of the old church. The Township Hall, built during the Great Depression by local men, still serves as a community center. Erected 2004 by Solomon Valley Highway 24 Heritage Alliance, Inc.
south side of Hwy 24 in roadside park. Marker is in this post office area: Bogue KS 67625, United States of America. Touch for directions. Other nearby markers. At least 5 other markers are within walking distance of this marker. St. Francis Hotel (about 400 feet away, measured in a direct line); Main Street Boom and Beyond (about 400 feet away); a different marker also named Nicodemus (about 400 feet away); First Baptist Church (about 600 feet away); Nicodemus Baseball History (approx. 0.2 miles away). More. Search the internet for Nicodemus. Credits. This page was last revised on April 23, 2019. This page originally submitted on March 28, 2019, by Cosmos Mariner of Cape Canaveral, Florida. This page has been viewed 93 times since then. Photos: 1, 2, 3, 4, 5, 6, 7. submitted on March 28, 2019, by Cosmos Mariner of Cape Canaveral, Florida.